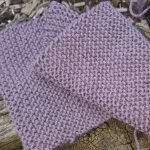 This simple sampler scarf pattern is easy to knit, and will give you an opportunity to practice a few of the textured knitting stitch patterns I have on this site. To test the pattern, I have made one using of Off White Panda Heath 8 Ply which is 50 percent wool and 50 percent Acrylic. This particular brand of yarn has approximately 220 metres of yarn for each 50 gm ball. If you decide to try out the pattern with another type of yarn, the quantities are likely to vary significantly. If you use 100 percent pure wool, each 50 gram ball will contain only 95 - 100 metres, so you will have to double the quantity. Please check your tension carefully. If less stitches use smaller needles, if more stitches use bigger needles. Cast on 50 sts and knit 60 rows. 1st row: K1, *P6, K6, rep from * to last st, K1. Repeat 1st row 9 times. 11th row: K1, *K6, P6, rep from * to last st K1. Repeat rows 1 – 20 twice more (60 rows). Knit 60 rows (garter stitch). 2nd row: K5, *P10, K5, rep to end. 3rd and all alternate rows: Knit. 4th row: P1, *K5, K10, repeat from * twice, K4. 6th row: P2, *K5, K10, repeat from * twice, K3. 8th row: P3, *K5, K10, repeat from * twice, K2. 10th row: P4, *K5, K10, repeat from * twice, K1. 12th row: P5, *K5, K10, repeat from * twice. 14th row: P4, *K5, K10, repeat from * twice, K1. 16th row: P3, *K5, K10, repeat from * twice, K2. 18th row: P2, *K5, K10, repeat from * twice, K3. 20th row: P1, *K5, K10, repeat from * twice, K4. 22nd row: K5, *P10, K5, rep to end. Repeat rows 3 to 22 until you have completed 60 rows. 1st row: Knit to end. 2nd row: K1, purl to last stitch, K1. 5th Pattern Block – Repeat Checks Knit 60 rows (garter stitch). Cut 12cm lengths of yarn. Separate out four strands and fold in half. Using a crochet hook to pull the loop through the knitted fabric and then threading the ends through the loop to form a knot. Repeat along both edges of the scarf. 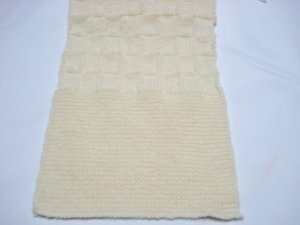 I hope you enjoy using this simple sampler scarf pattern. If you would like to download a printable version of this pattern, just click on this link.